We really enjoyed this camp. The climate was ideal, and the food was great. We also saw many fantastic animals and enjoyed fairly sincere amounts of Tusker - the local beer. Interesting thing we noticed: in Kenya, everywhere we went, women were served beer in fluty glasses, whereas men had chunkier glasses. We asked, and it is deliberate. The lounge at the Ashnil Samburu overlooked a watering hole, and we did see many visitors to both it, and the camp. Out on the savannah, there were lots of different animals to see, as well. 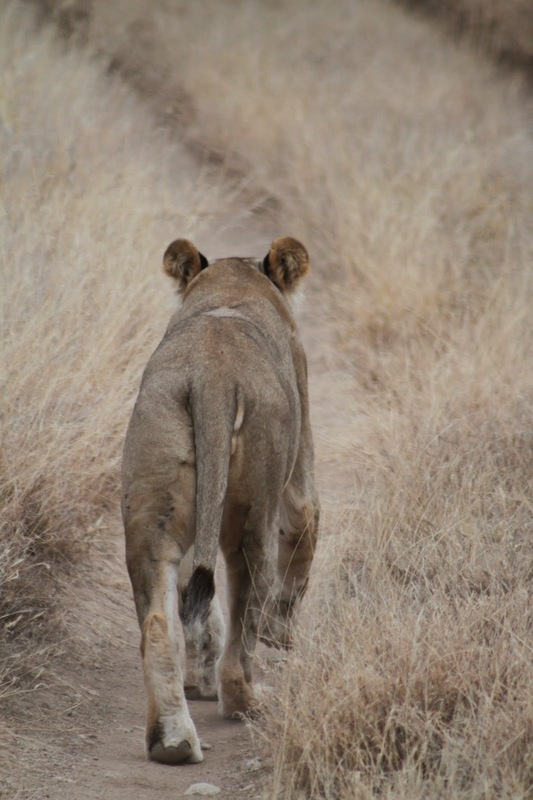 This lioness led us down the road for more than a half an hour. And the sunsets in Kenya are breathtaking.